Monarch butterfly caterpillars living next to roads may be stressed by the sound of passing cars and trucks, according to a new study from the University of Georgia. Researchers found that monarch caterpillars exposed to highway noise for short periods had elevated heart rates, a sign that they were experiencing stress. With roadsides increasingly promoted as sites for pollinator habitat, the findings could have serious implications for monarch butterfly conservation. Monarchs, with their bright orange and black wings, are among the most recognizable insects in North America, known for their epic fall migration that can take them thousands of miles from their breeding areas in the U.S. and Canada to wintering grounds in Mexico. But monarch numbers at overwintering sites have been declining for decades, and some believe this is due to loss of breeding habitat. In response, concerned individuals and organizations have promoted the creation of pollinator gardens, including along roadsides. "It seems like it's a win-win," said the study's lead author, Andy Davis. "Not only are they located all across the country, but roadside wildflower plantings are pretty and can reduce maintenance costs at the same time. But one of the things that's been overlooked with this push to develop roadside habitats is the vehicle noise. If you actually step outside and listen at one of these roadside habitat sites, it's deafening." Davis, a research scientist in the University of Georgia Odum School of Ecology, specializes in conservation physiology, a new and developing field that examines how the physiology of animals is affected by their environments and how that knowledge can inform management decisions, especially for species of conservation concern. Research on the effects of human-generated noise suggests that it induces stress reactions in people and many wildlife species. Few studies have focused on insects, however. "We know that an increase in heart rate is a universal stress response in the animal kingdom," Davis said. 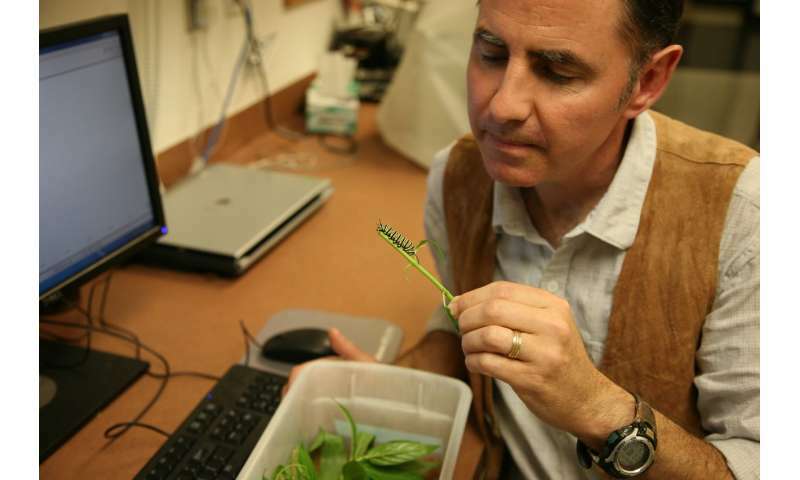 "But this is the first project that has ever attempted to look at the actual physiological stress reactions of monarchs." Davis and his team—undergraduate researchers Hayley Schroeder, Ian Yeager and Jana Pearce—placed monarch caterpillars in two rooms with identical light and temperature conditions. One room contained stereo speakers through which a looped recording of loud highway noise could be played; the other room was kept quiet, as a control. 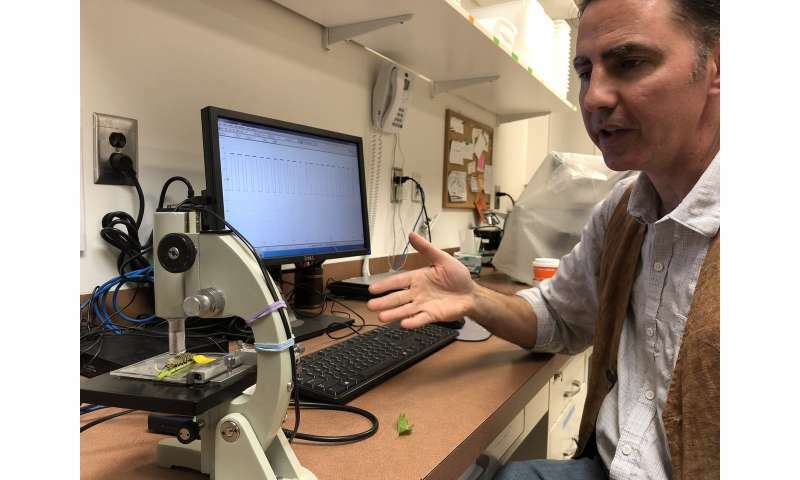 Before beginning the experiment, they measured all the caterpillars' heart rates with a non-invasive electronic device that used an infrared beam to sense the contractions of the caterpillars' hearts as they pumped blood. The researchers played the road noise recording at the original decibel level for two hours and then measured the heart rates of all the caterpillars from both rooms again. They conducted the experiment twice, once in 2016 and again a year later. They found that caterpillars exposed to short-term highway noise experienced a 16 to 17 percent increase in heart rate. "This is the same magnitude increase as humans experience if we're exposed to a stressor," said Davis. "And I know from some of my work with other insects that if they're stressed, their heart rates increase by the same magnitude too. So we're confident this is a real stress reaction in the monarchs." In the real world, however, caterpillars near roadsides would experience highway noise for much longer than two hours. Davis and his team therefore set out to explore the effects of long-term noise exposure. They conducted two trials, one that lasted for seven days and one for twelve days. Unlike the caterpillars exposed to short-term noise, caterpillars in the long-term trials did not exhibit an elevated heart rate by the time they had finished their caterpillar stage. 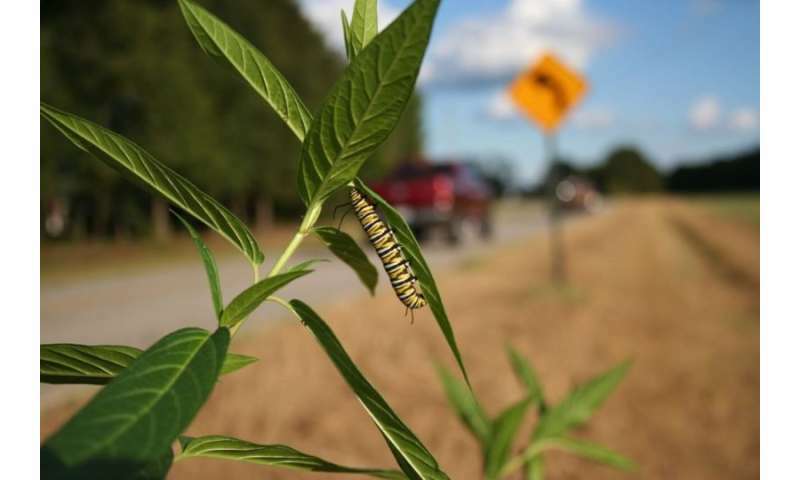 Davis said this could mean that over time the caterpillars either became used to the stress of highway noise or became desensitized to it—which he warned could lead to serious problems for monarch butterflies during migration. "The whole reason heart rates increase when animals perceive a threat is so they can pump more blood to the muscles to help them escape or defend themselves," he said. "The monarchs' journey to Mexico could be one of the most stressful journeys that any insect undertakes in the world. Every day these migrants are faced with a series of stressors that they need to overcome, whether it's fighting against wind currents, trying to find enough food, or, ironically, dodging cars on freeways. The last thing we want is for them to have an impaired stress reaction." While they found no change in caterpillar heart rates after the long-term trials, Davis said that the researchers did observe behavioral changes in the group exposed to noise. Those caterpillars were more aggressive than those in the control group, fighting with one another more often and even, in a couple of instances, biting the researchers. "I was shocked," he said. "It was just a little pinch but it was just so surprising. I checked with a number of long-term monarch researchers, who've collectively probably reared over 10,000 monarch larvae, and they said they've never, ever had that happen. But if you look at the literature, there is some research that shows that heightened levels of long-term stress in insects is usually correlated with levels of aggression." Davis said that more research is needed to determine whether roadside noise affects monarchs' ability to migrate. "By putting in these roadside habitats that are meant as a conservation measure, we're essentially conducting a long-term experiment," he said. "I think our research demonstrates that we need to have more information before we continue to move forward." When you add in what must be increased levels of chemical by-products of combustion settling nearby as well as rubber dust eroded from tires and various other toxic materials shed by tens of thousands of vehicles, and any salt or other chemicals used for de-icing, not to mention the asphalt or other paving materials used, it would probably be a good idea to mix things up and try to get green corridors going in more remote areas along country roads for instance or between rural landowners' property lines, etc. Any and all increase in native pollinator species enabled by such practices would be a boon to gardens and various crops.